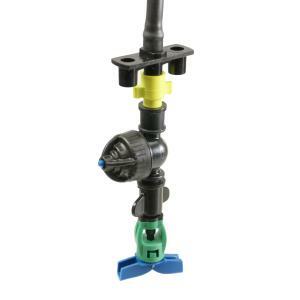 The Green Spin overhead micro sprinkler is widely used in greenhouse applications. This model Green Spin assembly is equipped with an anti-mist feature and a weight to keep the sprinkler hanging straight. Its unique bridgeless design eliminates two major problems, dripping on the plants below and dry spots. The swivel design produces a flat trajectory keeping objects dry above the nozzle level. Applications include: Irrigation and propagation, greenhouse or hoop and shade houses, cooling of poultry and livestock.